Such a lot of hard work! 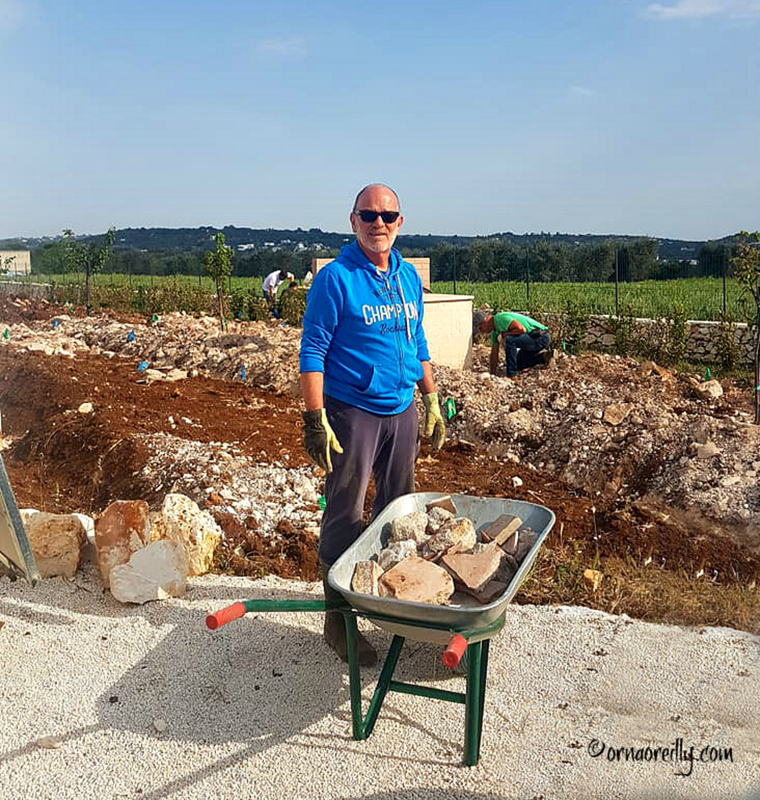 Tom is mowing our brand new lawn as I type and it doesn’t seem that long since the two acres, which comprise Villa Allegra, closely resembled a barren moonscape. 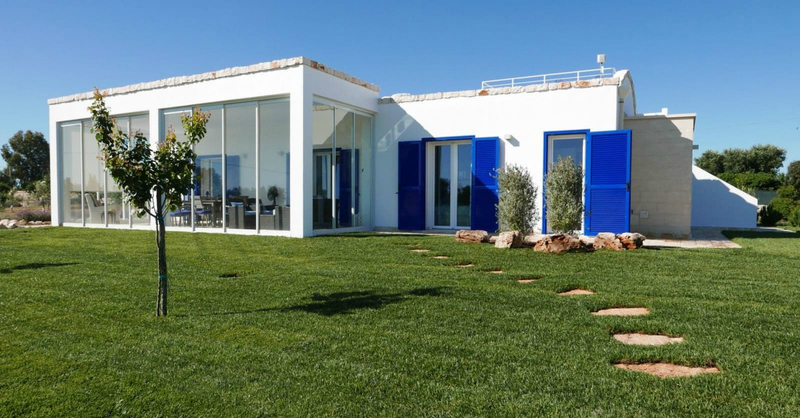 In October 2016, we moved into our brand new home, which we called Villa Allegra. In English, this means ‘Happy Villa’ and it is certainly cheerful now, though there were moments during our first year when things became quite stressful. 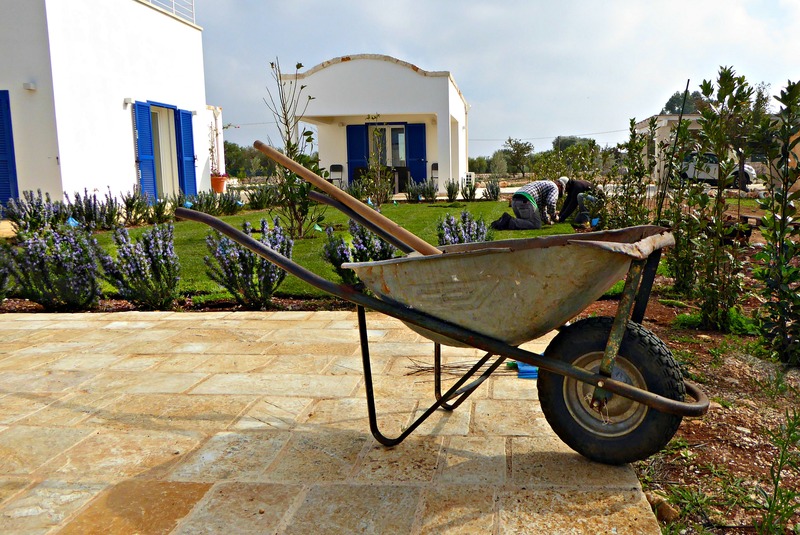 In Spring last year, I wrote a blog entitled ‘The Reluctant Olive Farmer’ about my husband, Tom, outlining the trials and tribulations he underwent as he tried to figure out how to transform our wild, unkempt building site in Puglia into an olive farm with an oasis/garden around the house. It wasn’t easy, to put it mildly. We appeared to be faced with an impossible task. How to tame this piece of raw, Pugliese countryside? This year has been lots of hard work for Tom, but the transformation is, finally, well under way. Our 80 olive trees are flourishing unbelievably, as are our fruit trees, laurel, magnolia, mimosa, lavender, oleander and rosemary. 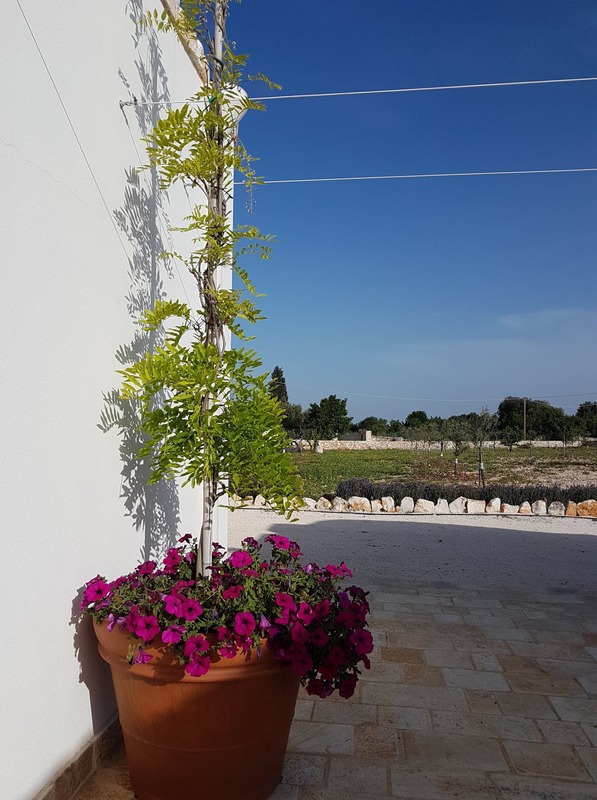 We even planted gelsomino (jasmine) and glicine (wisteria) on the stark branches of four dead olive trees – rashly installed by our builder when the house was being built and sadly neglected. Now they have come to life again in another form! Unfortunately, our two beautiful bougainvillea did not survive the ‘Beast from the East’ which hit us with freakish snow and minus 5⁰ Celsius temperatures at the end of February, though we had covered them carefully at the onset of winter. These have since been replaced by wisteria, which we hope will fare a bit better, should freezing weather occur again. Our lawn was installed in two separate phases. First of all, last September phase one occurred and lawn, complete with pop-up sprinklers, installed. Then, in October, came the glassing in of our veranda. The glass is technically removable, though we don’t ever intend to take it out. It has been a great boon, as our veranda was previously a very windy spot. Now we can use it virtually all year round. In May this year, the second phase of the lawn installation took place. It has made a huge difference to the house and our ‘oasis’ is taking shape. Also in May, I designed a rockery, now built, which should provide some shelter by the pool and add colour to the landscape. Tom’s ‘effeminate’ strimmer and plastic wheelbarrow have long been replaced by a suitably manly strimmer and a heavy metal wheelbarrow. We even have a leaf blower, a lawn mower and many garden tools and instruments, which Tom now uses efficiently. Here he is doing his very first mow in April this year. He has been greatly encouraged by our wonderful neighbours who have given endless support, having gone down the same route themselves previously. Life here is good. We walk a great deal through the olive groves and often head down to Villanova, a local beach which has a picturesque walking and cycling path along the coast. Sometimes we drive to the aqueduct between Cisternino and Ceglie Messapica – except on Sundays, when it is quite busy with walkers, joggers and cyclists. We prefer it to be peaceful, which it otherwise is. 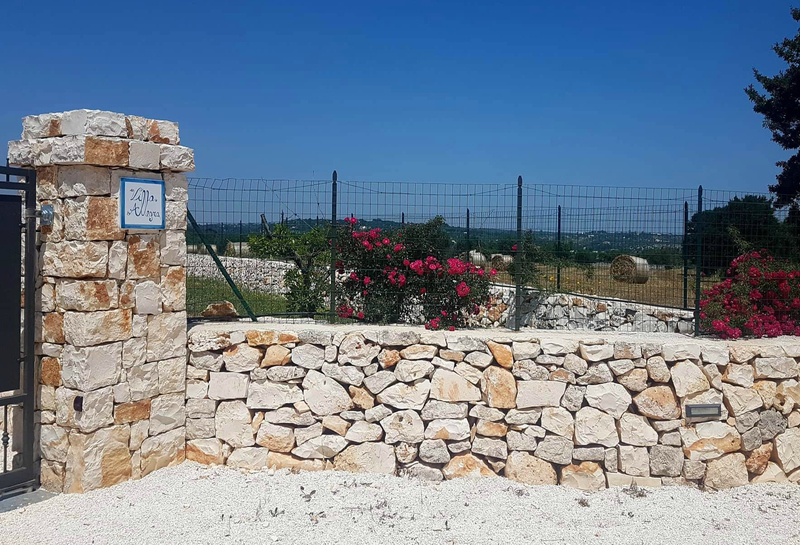 It’s a beautiful walk, dotted with trulli and gorgeous countryside. 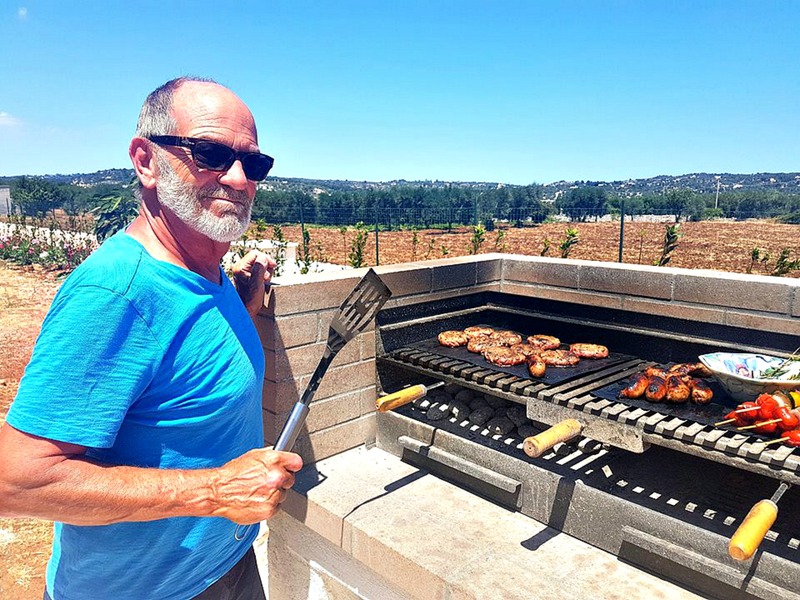 Tom has become very handy with the barbecue too and we regularly invite people around for grilled swordfish and more. We eat out fairly regularly and Sunday lunch is our favourite time to visit restaurants near and far. Many restaurants along the beach resorts close in winter, but the ones that are open are a pleasure to eat at with their fresh-as-a-daisy fish and excellent wines. I love the cooler months here too, when the area is peaceful and tourist free. Cool, with invariably blue skies, Puglia has to be up there as one of the prettiest places I have ever seen. In summer, however, it is a lot of fun to eat at the beach, where we can watch the activities and join in without getting sand on our feet, while we eat fresh orata (sea bream), branzino (sea bass), spada (swordfish) or delicious gamberi (prawns) fresh from the sea. And accompanied, inevitably, by a glass of chilled rosato. Tom and I have recently celebrated our first two years of marriage and I firmly believe that being together 24/7, 365 days of the year since we arrived in the Pugliese countryside, has been a true test of our compatibility. And I would have to say, so far so good! Night night from Villa Allegra. So reassuring to see abandoned land return to its potential. Kudos and thank you to you and Tom. I will be in Lecce 14 sept – 13 oct soaking in the magic. 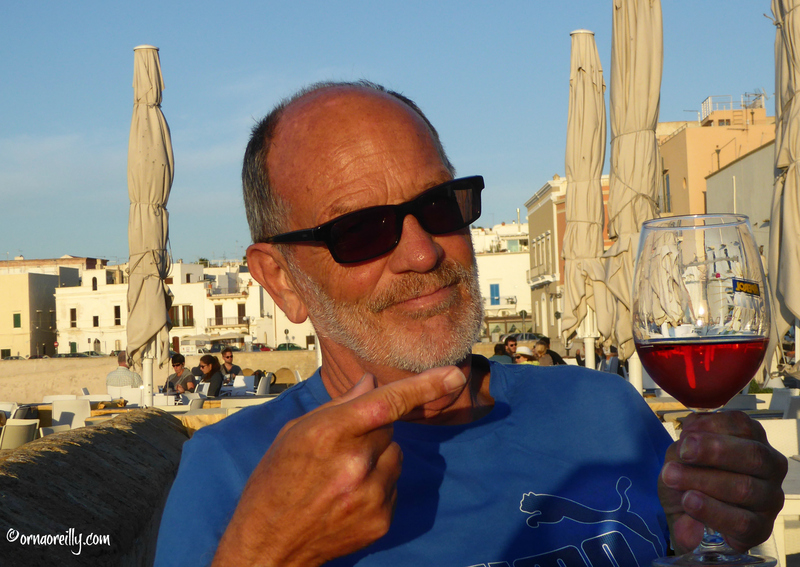 The tour I give – Magical Puglia – begins 13 oct. If you happen to be in Lecce while I am there perhaps we can meet for a coffee! Wonderful Orna…. Villa Allegra is indeed an oasis. I can’t even imagine the work that went into getting all those rocks out of your ‘lawn’ and all the other hard work that has gone into the property. Wow. What an amazing transformation – simply gorgeous. So happy for you and Tom! Each post I read of yours and his just makes me warm all over, seems like a fairy tale come true. While I’m sure there must have been numerous challenging moments, your adventure and transformation of that formerly barren piece of land have been a delight to follow. All the best for the future – auguri! There are many towns along the Pugliese coast that remain open during the winter: Otranto and Monopoli are two that spring to mind. Both gorgeous. Most of the seaside villages close down at the end of September, but you will always find a little restaurant or bar that the locals use where there is a port or a lungomare, where people like to walk in winter.